It was back in 2012 that Escentual.com presented the first-ever French Pharmacy month (how crazy is that?). Since then, French Pharmacy skincare has taken the world by storm and by now most people have something a little ‘ooh la la’ in their skincare regime. That being said, French Pharmacy skincare is still unchartered territory for many. And I can understand why, there’s so much to choose from! If it isn’t which brand you should pick, it’s which product will work the best for you. That’s why I’ve taken things back to basics in this edit, to make French Pharmacy skincare accessible for all – the savings (up to 1/3rd off) and innovative formulas are just too good to miss out on! Makeup: it’s fun to apply and wear, but removing it can be a pain! But it need not be. All you need is the right products, and makeup removal can be not only easy, it can be pampering too! 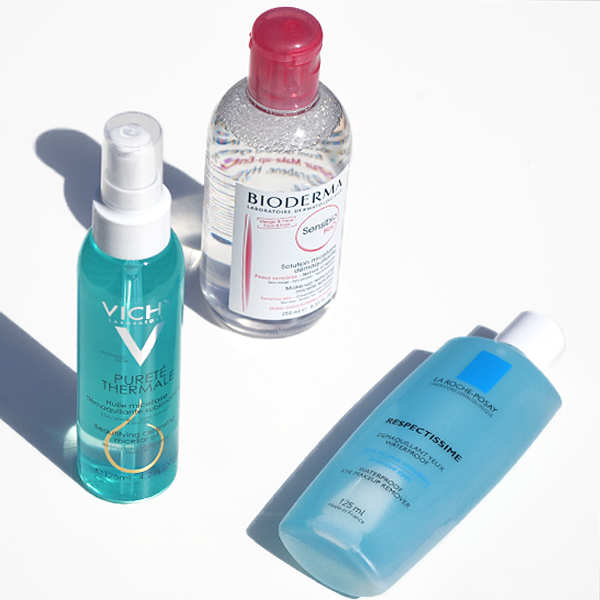 Forget rubbing or pulling the skin, these bestsellers ensure that makeup removal is super simple. One of the most-coveted French Pharmacy products, the Bioderma Sensibio H20 Micelle Solution is skincare royalty. Loved for its alcohol-free, soap-free and fragrance-free formula, the non-rinse micellar water will soothe and cool the skin, whilst removing every last trace of makeup. Ideal for those avoiding tap water, the fuss-free cleanser is loved by makeup artists because it makes removing makeup quick and most importantly, easy. Everyone needs a dedicated eye-makeup remover, and the La Roche-Posay Respectissime Waterproof Eye Makeup Remover has been creating quite a storm since its release at the beginning of the year! Created especially for sensitive eyes and contact lens wearers, the bi-phase formula respects the tolerance of skin, whilst removing even waterproof eye makeup (without any tugging). If you prefer using an oil to remove your makeup, look no further than the Vichy Purete Thermale Beautifying Cleansing Micellar Oil. Suitable for all skin types, the non-greasy oil transforms from an oil to a milk upon contact with water, melting away all of your makeup. Enriched with camelia oil, the cleansing micellar oil will also smooth and moisturise, leaving skin makeup free and radiant. You may be thinking; why do I need a cleanser and a makeup remover? And the answer is simple, to wash your skin in the morning (when you’re not wearing makeup), and to double cleanse at night. If you’re wearing a heavy-duty makeup look, one cleanse may not cut it, so double-up and you’ll be sure that your skin is as clean as possible. If you’re new to French Pharmacy then you may not know the vast amount of love people have for the La Roche-Posay Effaclar range. A holy grail product for many is the Effaclar Purifying Foam Gel, a non-irritating foaming gel, which lifts dirt, grime and sebum away from the surface of the skin. If you have oily or/and imperfection-prone skin, this cleanser will transform your skincare regime. If you have sensitive skin it can often be a chore to find a cleanser that won’t make you red in the face. But worry no more, because the best-selling Nuxe Micellar Foam Cleanser with Rose Petals will not irritate or upset the skin’s delicate balance. Instead, the foam cleanser will moisturise, cleanse and provide it with antioxidant protection, thanks to the core active principles of 3 roses (black, red and white) and green tea extract. If you want to add a little luxury to your cleansing regime, then stop your search at the Darphin Aromatic Cleansing Balm. Loved for its indulgent balm-to-milk formula, the luxe balm contains a plethora of skin-loving essential oils, including ylang ylang and rosewood, which eliminate impurities, nourish and soften the skin – all in one! The main reason exfoliating your skin is important is because it removes dead skin cells from the skin’s surface, making your complexion look much more radiant. But, that’s not all it does; exfoliating will also help to prevent wrinkles, improve the absorption of other skincare, increase circulation and reduce the number of spots. A number of very valid reasons as to why you should exfoliate 2-3 times per week I think! Not a fan of grainy exfoliators? 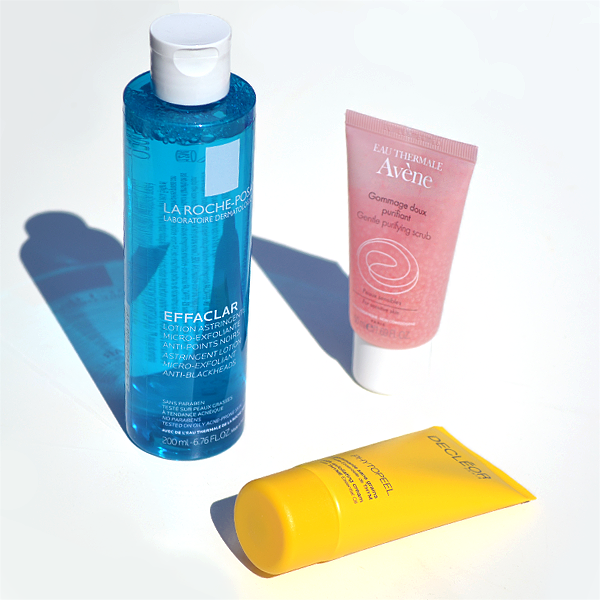 The La Roche-Posay Astringent Micro-Exfoliant Lotion is the ideal alternative. A toning tonic specifically formulated for oily, acne-prone skin, the transparent fluid unclogs and tighten pores thanks to micro-exfoliating LHA, which breaks down the bonds between dead skin cells – all you need to do is swipe! If you search the Escentual site, you’ll see that our exfoliator catalogue is vast, and so it can be hard to pick out the right formula. If you’re on the hunt for an exfoliator that’s perfect for everyone (perhaps you want a communal one for you and your partner), then meet the Decleor Phytopeel Smooth Exfoliating Cream. Delicate enough even to be used underneath the eyes, the soft cream formula is a great glow-enhancer and will fit into any routine. Don’t believe that those with sensitive skin can use an exfoliator? Think again! The Avene Gentle Purifying Scrub is made specifically for those with reactive skin. Formulated with exfoliating microspheres and Avene thermal water, the scrub ideally balances the skin, lifting away surface debris whilst keeping skin calm and comfortable. At this stage in your routine you should be targeting any skin concerns. This could be anything from blemishes and dryness, to dullness and redness. 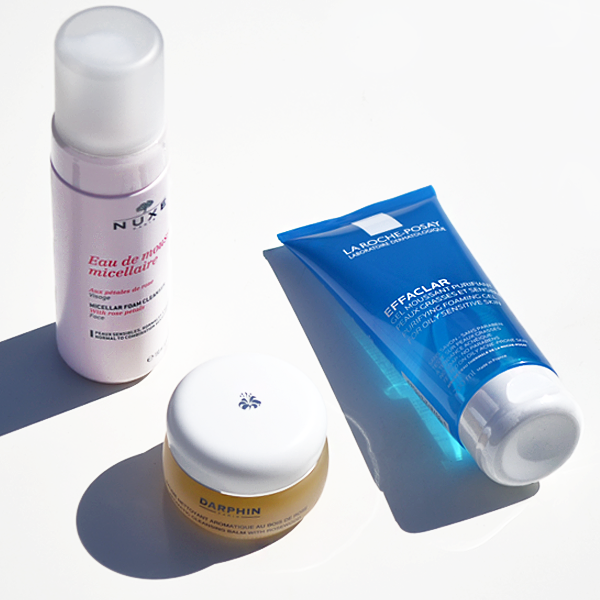 And with a treasure trove of cult-favourite boosters in the French Pharmacy category it was hard to pick just three, so keep buzzwords like hydration and radiance in mind when searching for your ideal booster. The La Roche-Posay Effaclar AI has always flown off the Escentual shelves, and quite rightly so because it’s a skincare game-changer! The perfect boost for blemish-prone skin, the treatment not only treats breakouts that have already formed, but stops them from appearing. With an all-star ingredient line-up of niacinamide, piroctone olamine, glycacil, exfolating LHA and La Roche-Posay thermal spring water, this targeted treatment will bring you a step closer to a fresh and clear complexion. 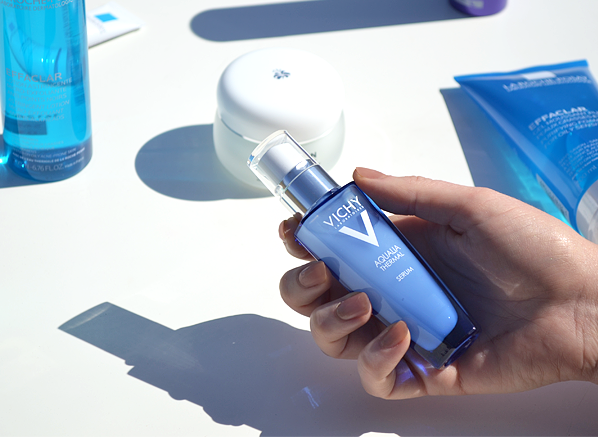 If you’re after hydration, there’s nothing quite like the Vichy Aqualia Thermal Dynamic Hydration Power Serum. Lightweight and silky, the quenching serum contains Activ Hyaluronine™, a combination of hyaluronic acid and lipidure that is proven to infuse lasting moisture (48-hours worth of hydration to be exact). A big drink of water for the skin, the Aqualia Thermal Dynamic Hydration Power Serum is the perfect match for anyone looking to tackle dryness and dehydration head on. If you’re burning the candle at both ends and your skin is showing it, you need Nuxellence Detox Detoxifying and Youth Revealing Anti-Aging Care. Not only will the overnight treatment boost the effectiveness of everything else in your skincare routine, but it will also improve the skin’s rate of renewal and repair the skin’s mitrochrondial DNA. In simpler terms, it will detox your skin overnight so that you awake glowing – yes please! Moisturisers matter! 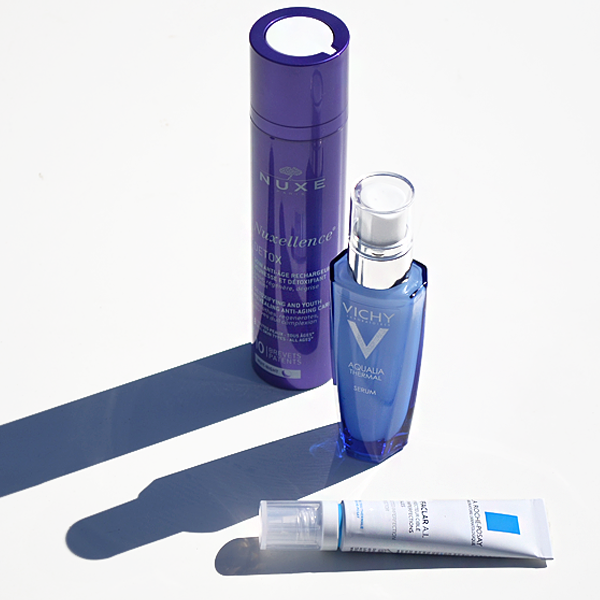 Proper hydration makes skin not only look healthy, but feel plumped and nourished. Moisturising daily will not only leave skin feeling amazing, but it will also reduce the rate of skin ageing – an excellent excuse to cocoon your skin in the most indulgent textures! 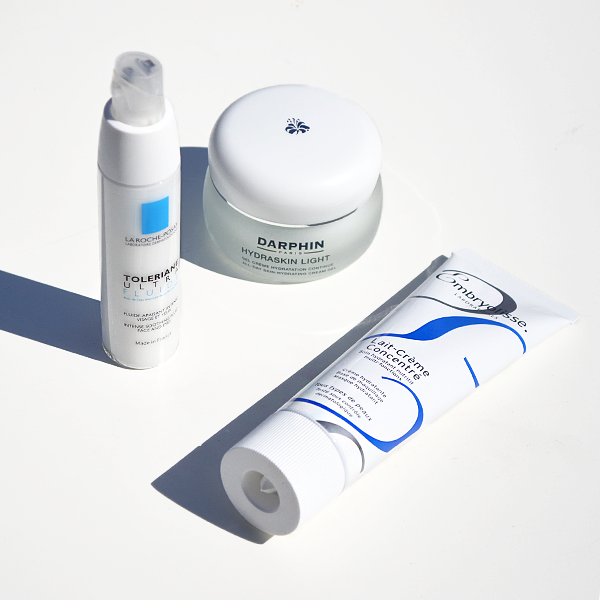 If you want your moisturiser to feel refreshing and light on the skin, the Darphin Hydraskin Light All-Day Skin Hydrating Cream is the one for you. Made with a high-performance hydrating complex of powerful yet natural ingredients, this popular moisturiser helps to build up the skin’s moisture levels and defend its critical moisture reservoir, for continued moisture all-day long. If you suffer with sensitivity skincare shopping can be a tad tricky. But luckily you can shop with confidence when buying the La Roche-Posay Toleriane Ultra Fluid, as this moisturiser will soothe, moisturise and calm reactive skin, thanks to a combination of La Roche-Posay thermal spring water and anti-irritant neurosensine. This product is truly amazing. It zaps pimples as they're forming, cutting short their life cycle. Also, as someone with super pale skin that gets a red scar/pigment if their skin even hints at a spot, I'm amazed that this seems to stop the pigmentation process in its steps as well. This entry was posted on Friday, April 14th, 2017 at 9:00 am and is filed under French Pharmacy, Skincare, Skincare Edit, Tried & Tested. You can follow any responses to this entry through the RSS 2.0 feed. You can skip to the end and leave a response. Pinging is currently not allowed.